I agree this "should" not happen on its own and have never heard anyone ever report similar but I also take him on his word that he is a 6 year user who says not changing it and started in conjunction with a new i pad. taking his Game Line up Screen shot literally, the first thing i noticed is duplicate player names listed and I know iscore does funny things if same player is listed twice in a game. So I was wondering, when you look at his data base if you saw true double player listings at the unique player ID identifier level. If not, then truly an editing thing. but If truly duplicate players listed (not sure how he did it, but we know iscore does not like that at all. and the solve is remove both duplicates in starting line up editor and then re add back correct player from pick list and put in correct order. The database as it stands now does not have a duplicate Kye Snodsmith on the game on 4/11/18. 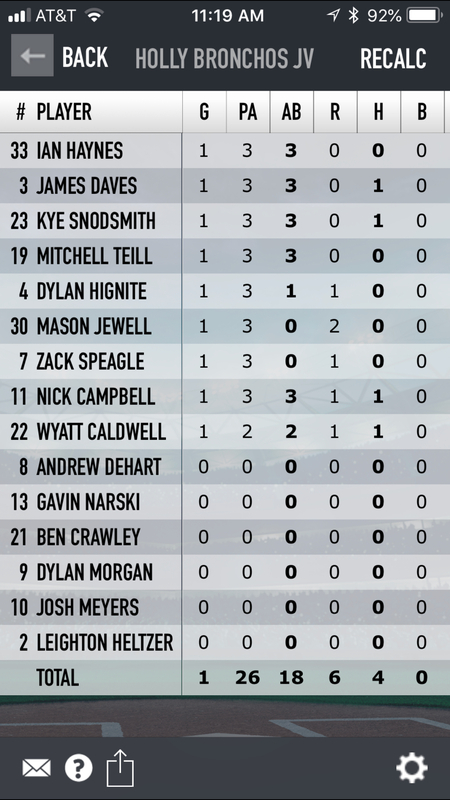 However, on more recent games he has Kye Snodsmith as #4 (same internal ID and that is why the Player Card shows #4 for Kye Snodmith on one set of games and #23 for another), and he has Andrew Dehart as #23. This changing of numbers is what leads us to believe player names were being edited to match jersey numbers instead of editing jersey numbers to match player names. It sounds like a small thing, but jersey numbers can be different from game to game and are kept on a lineup, and player names are not stored different from game to game but are associated with the underlying player ID. So if you are ever editing player names, you are editing them across the board and may not realize it in the heat of a game. The only number is 6 and 2 that have been used on multiple players. Everyone else are players that have been on the roster with same number since we created the team. We have used i score for the last 5 years and have never had this happen. It has to be glitch in this version since it is a new I-pad we used this year. When changes are made they are made in the field by selecting position and who replaces them the same way we have been doing for 5 years. I-score needs to up their tech support this is crazy trying to communicate day to day. It has been almost a month and nothing resolved. I will have to basically delete this whole season which stinks because stats carry all through high school and now will be lost. It would be nice to offer a call fix your problems or set up a time we can be online at the same time. you can email me at yo_dan@comcast.net if you think you can help me. @dan, I am sorry for your troubles, as i am sure support is too. I understand you are under time pressure as new season starting, but as support said, there is Forum and Email support, not phone. In re review of the entire thread. i do see that support has answered your posts same day or within 24 hours. however, i am not sure you have answered back in as timely a manner and with the specific explanation and exact steps taken so they can try and replicate and trouble shoot your problem asap. FYI - I am a long time user of iscore, you can search this forum and see i am not part of the company, just a user who has helped many folks around the world through this forum use their program and resolve issues, often within hours. I do not want to make you defensive, but right or wrong iscore does not offer live phone support - never has. This is it. we can debate the business model , but it is what is, the software is low cost and the support folks have a great history of going above and beyond to help folks. they strive to be responsive on the forum and through email. I have used other scoring programs and this has been a cut above. So you know, There are many iscore iPad users who use the product daily and have never experienced names or line up positions changing on their own. (no one else has echoed your issue over last month on this thread either). I have read virtually every post on this forum for over 9 years and this is the only time this has been mentioned. the developers also have a list of problems reported. ALL that said, you have experienced something unexpected and for yourself and the broader community, I would like to see it understood and resolved. I believe Support would have similar positive intent. We want to help you , determine the cause and fix so no issues in future. To be specific, below quote was supports last hypothesis, Can you respond to it , in detail? * Is it possible, the scorekeeper on the 4/11 game edit names not numbers, as support hypothesizes. different scorekeeper than normal? * you say you try to fix and it has changed back , can you provide the exact steps you use to correct / edit etc . * before and after screen shots are really helpful. so support (and i) can know starting at same place and getting same result (or not). Again, i understand you are a 6 year user, not questioning your commitment, just the program has not had this glitch before and it is serious and want to isolate and fix if a code issue . @support, how can you reconcile the screen picture Dan sent showing two Kye Snodmith #23 and #4 in the line up. with your data base showing only 1 Kye Snodmith for game 4/11 . ? to me that seems impossible, the only way is if looking at different games or time stamps of database. @dan. also, it may be helpful if you provide the type/model of "new" IPAD and the Version of iscore you are using. I see neither of those have been posted on the thread. 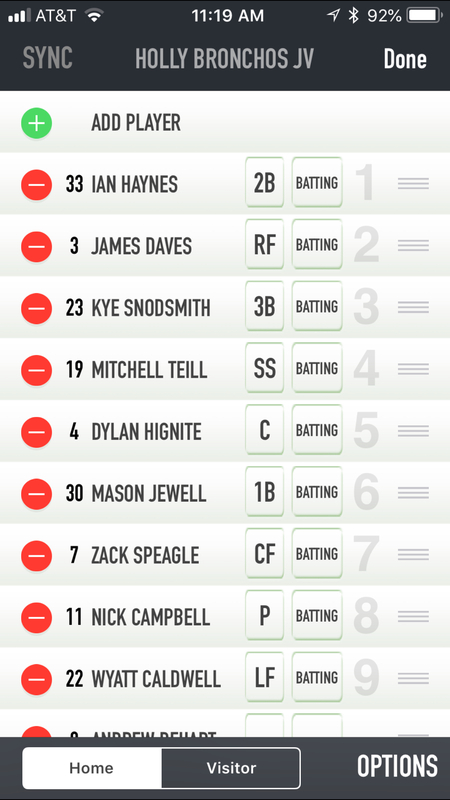 Yes, there is only one Kye Snodsmith in the Lineup and Stats for the game on 4/11 when we look at the customer's data. With jersey #23 in both cases. All we can do is ask again for specific steps to reproduce any issue so we can help identify what is going on. When we look at the data from the customer, nothing looks incorrect to us. The players have had different jersey numbers in different games and our belief is the scorekeeper had to have changed either the jersey numbers or player names while scoring games in order for this to happen. If we can get specific steps to see player names changing, we will try and reproduce on a device here, but as of yet have not been given any steps despite having asked several times. I have and continue to echo the need for specific steps with screen shots .. i will add the need to be very clear on when last option > export occurred - so all working on same data. I find it both interesting and concernig the line up support just posted does not match the screen shot dan provided nor the scorecast screen shot i provided. Same game and three different versions. Somewhere change is happening. app and reopen the 4/11 game ... do you get the same line up.? Yes, same lineup. When you view the iScorecast, that data is from a "point in time" when the iScorecast was done. If the user goes in and edits player names, the scorecast would not be updated unless they do iScorecast Synchronize. This would be more evidence that the user is changing the names. Our guess is they are doing it unknowingly, but without the repro steps, we can not pinpoint what is going wrong.